Forn Halr is Jotun's Bane Kindred's holy tree. He is a tall and gnarled oak tree and he is the focus of our kindred's outdoor Ve, located at Gaea Retreat near McLouth, KS. The name Forn Halr is old norse for "Old Man." Every oathed member of Jotun's Bane Kindred has taken their oath beneath his branches, and with one hand upon his bark. We conduct fainings in honor of Forn Halr and give him the gifts he is due. When our kindred faces trouble or hardship, we think of Forn Halr's example...a lone oak, long-lived and tall, upon the edge of a cliff, with his roots twisted down into the earth and rock. We held Lightning Across the Plains and our Ostara Gathering at Gaea Retreat. This allowed heathens from across the region that wished to visit Forn Halr and honor him, the chance to do so. A number of new kindreds took their kindred oaths beneath his branches. As a kindred, we proudly share our successes with Forn Halr. After we initially built our Ve, we realized that the altar we had built was insufficient. 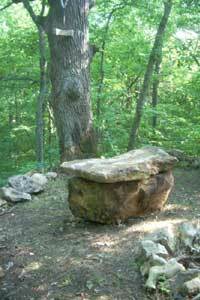 With assistance from Gaea's caretaker, we built a new stone altar from two large rocks. We estimate the base rock at over 2000 lbs., with the top of the altar around 900 lbs. It took back-breaking effort to move these stones into place by hand, but it was worth it to give Forn Halr a worthy altar. Forn Halr also wears around his neck a hammer named Skull-Splitter. The hammer was made by Craig Winkler for Forn Halr. For several years we would take Skull-Splitter down at Lightning Across the Plains for use in the hammer toss. We felt that using Forn Halr's hammer for such a contest gave him honor. But, at LATP 2011 the ring on the handle broke. We fixed the ring, and decided that Forn Halr should wear Skull-Splitter always. We then used a different hammer for the hammer toss at LATP. THE FABLE OF FORN HALR - "The Oldest Oak"
One young oak asked, "Why do you struggle so hard on the edge of that bluff? You should give up like the rest of the acorns that landed there. That's no place for an proud oak to grow." The small oak on the edge of the bluff answered, "It is true that I'm the only oak remaining on the edge of the bluff. I did not choose this place to grow...this is where I fell. But, I'll never give up. I'll work, and I'll struggle, and I'll make the best of this rocky home." Another young oak said, "See how tall the rest of us are. Are you not ashamed that you are so stunted and small?" 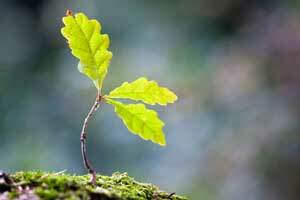 The small oak on the edge of the bluff answered, "I feel no shame in making the best of my situation. You seem to take great pride in growing easily in the rich soil you fell upon by complete chance. I take great pride in making the best of my difficult situation." Many years passed, and the oaks growing on the stretches of black soil had gotten much bigger and were crowded together. They roots were tangled in knots beneath the soil. They fought to reach higher than their neighbor so that their leaves could gather the sunlight they needed to survive. Some of them had been crowded out and died. The oak on the edge of the bluff was not as tall as the other trees, but his roots were not tangled with the roots of other trees. He was not crowded by other trees. So his limbs reached out in every direction gathering plenty of sunshine. Still, the crowded oaks liked to tease their brother out on the edge of the bluff. One of the oaks said, "Look at you all alone out there on the bluff, you must be very lonely out there. The oak on the edge of the bluff answered, "While I am the lone oak out here among the rocks, I am not alone. Many smaller trees grow around me and below me at the foot of the bluff. 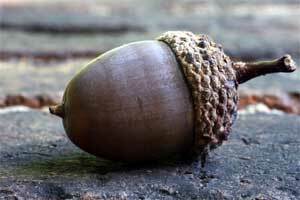 Some of them have grown from my own acorns. The shade from you and your tall brothers won't let the acorns that fall from your limbs grow." Another of the crowded oaks said, "It must hurt to have all those rocks among your roots. Why do you even bother?" The oak on the edge of the bluff answered, "Working my roots down into this soil has been hard work...that is true. But, now that they are there, I am firmly in place. I welcome the stability and am greatful for the rocks among my roots." 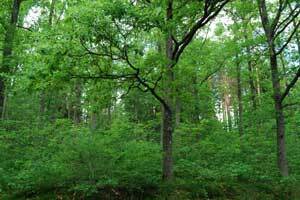 Many years passed by, and most of the oaks that had grown in the stretches of black soil were gone. Many of them had been sqeezed out by their taller brothers. Their roots could not grow out far enough to gather water and the shade from taller trees caused the leaves of smaller trees to wither and drop. 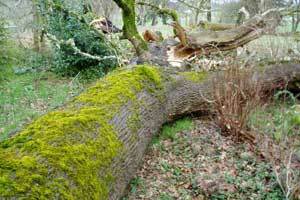 Many of the taller trees had grown so tall, so fast, that strong winds blew them down. Their roots had not been deep enough and had no rocks for them to grip. But the oak on the edge of the bluff was still there. He had lost some limbs to storms or disease. His gnarled roots had tangled themselves throughout the face of the bluff. But he had grown tall and broad and was healthy and happy, and his branches full of leaves. But, still the few remaining oaks would try to tease him. One of the remaining oaks said, "Look at your broken limbs and your gnarled roots. What a strange looking oak you are." The oak on the edge of the bluff answered, "I have lost some limbs and my roots are gnarled, but I have grown tall and prospered. I am full and healthy. So many of you trees in the black soil have fallen. I would rather stand here showing the scars of my long life, than to lie in the soil, the food for bugs." One of the remaining oaks asked, "Will you not miss us when we are all gone? Won't you be lonely when the last of us has fallen?" The oak on the edge of the bluff answered, "I've spent my many years making true friends. See this maple tree that has grown beneath me and helps to hold up my weight? See the squirrels and the birds who enjoy the shelter of my limbs and leaves? See the snake that makes his home among my roots? When you have all fallen, I will not be alone. I will be the oldest and the wisest being in the forest, with many wights who look to me as a friend." Many more years passed, and all of the oaks who had grown on the wide stretches of black soil had fallen. 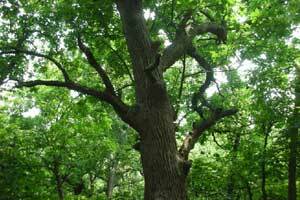 Younger oaks were growing in their place, among other types of trees and all manner of plants and bushes. The oak on the edge of the bluff was very old, but had grown tall and wide. The evidence of his age showed on his bark and in his limbs, but he wore these signs as the reward for a long life and much wisdom. All the plants, animals, and spirits of the forest paid respect to this old oak, and called him Forn Halr, which means the "Old Man." One day a group of men and women who followed the ways of their People came to the forest. They were looking to establish a holy place where they could honor their Gods and Ancestors. As they walked through the forest, every spirit whispered to them of Forn Halr. One spirit said, "If you need guidance, you should ask the Old Man." Another spirit said, "You should honor Forn Halr, he is the wisest among us." A third spirit said, "If you seek a holy place, then you should gather beneath the limbs of Forn Halr." The group of men and women found their way to Forn Halr, and paid their respect. They built an altar beneath his limbs and marked the holiness of the shade he provided. They spoke to him and gave him gifts. All their most important oaths were taken with a hand on Forn Halr's trunk, and they lived by his example. A holy runestone was carved with the likeness of Forn Halr and words that spoke of his timeless importance. A symbol of their Gods was hung around Forn Halr's trunk and they honored their Gods and their Ancestors at the base of this holy tree. The forest rejoiced that the wisest among them was honored in this way. Those that honored Forn Halr, prospered as he had, through hard-work and determination.